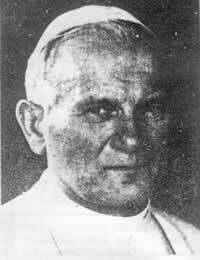 "John Paul II inaugurated an international meeting that will seethe with the power and the will to destabilize the USA, to immobilize and eliminate capitalist institutions and capitalism itself. To achieve this, the very same turmoil, disruption, loss of life, destruction of property witnessed in Iran will be introduced into our part of the world. Like it or not, the future of the Americas and of much of the rest of the world rides with the pope." San Bernardino Sun Telegram, February 26, 1979. "Clearly, the papacy seems headed for a new era of openness and vigor. 'As you can see, this is no longer a church of silence,' John Paul II told a cheering throng. 'The church speaks. The Pope speaks.' " – Newsweek, December 25, 1978. Eurocommunism expert Carl Marzani said: "The probable influence of John Paul II on East-West relations, on the Common Market, on Washington, is awesome and unpredictable." "After a 16-year climb up the Senate's seniority ladder, Edward M. Kennedy is in the strongest position ever to put his stamp on national policy. As new chairman of the Senate Judiciary Committee (Senate's largest), the Massachusetts Democrat is taking command of a powerful panel that has a say over everything from anti-trust policy and civil rights to criminal laws and confirmation of federal judges.... The senator's new job, combined with the mystique of his family name, makes Kennedy the Senate's newest 'baron.'" – US. News and World Report, February 5, 1979. "It is becoming increasingly evident that. . . (he) intends to exercise a degree of autocratic authority (over) civil rights, abortion (etc.)" 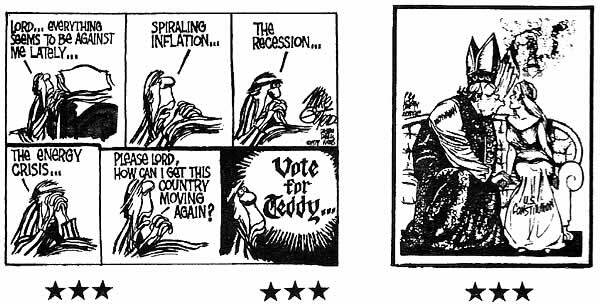 – Los Angeles Times, December 10, 1978. "The Last Kennedy proposed a revolutionary womb-to-tomb health-insurance plan for all Americans last week. . . Kennedy surrounded himself for the occasion with labor, consumer, church, civil-rights and senior citizens groups.. ." – Newsweek, May 26, 1979. "The Catholic Church is seeking to build a 'NEW SOCIETY'.. advocating a THIRD way different than capitalism and Marxism." – Los Angeles Times, February 17, 1979. "A Western hemispheric Catholic-Protestant ecumenical conference has agreed that Christians are called to explore a more radical alternative – including 'humanistic SOCIALISM' – to the prevailing. . . capitalistic system. . . (which) was called an 'idol..." – Religious News Service, June 21, 1978. "'Separation of church and state' is described by. . . Murray. . . (Catholic) writer . .. as 'that negative. . . un-American formula, with. . . religious prejudice.'. . . Murray is simply echoing the official teachings of many Popes. Pius IX. . . denounced as one of 'the principal errors of our time'. . . (that) 'The church ought to be separated from the State.'. . . O'Toole, Professor of Philosophy at the Catholic University. . . 'no Catholic may positively and unconditionally approve of the policy of separation of church and state...'" – American Freedom and Catholic Power, pp. 43, 49, by Paul Blanchard. "The Catholic hierarchy proposes to realize THE CATHOLIC PLAN FOR AMERICA (through the) 'LAY apostolate' working for a TOTAL CATHOLIC civilization – political, medical. . . and religious. . . the Catholic Church will be the 'MISTRESS and GUIDE.'" – Paul Blanchard. "All Catholics should do all in their power to cause the constitutions of States, and legislation, to be modeled on the principles of the true church." – Pope Leo XIII. Catholics have the largest representation in Congress with 129 seats. Methodists are next with 85 (in 1979). Catholic Governors number 12 and Methodists 8 (in 1979). "BEWARE, warns a vocal group of scholars: the Imperial Presidency may have faded, but now an IMPERIAL JUDICIARY (New autocratic Chairman Kennedy) has the republic in ITS CLUTCHES." – Time, January 22, 1979. "It is an understatement to say that the Roman Catholic Church is IN politics, IT IS POLITICAL." – Paul Blanchard. Liberal-left Kennedy's national health program, for years his principal issue, will be implemented by the U.S. Dept. of Health, Education and Welfare, RULED by fellow Catholic Califano. What would appear to be a 'good thing," however, goes beyond physical health care. NOTICE – "The National Institute of Mental Health. . . setting forth standards for healthy mental attitudes on RELIGION and moral conduct. . . will parallel the creed of the National Council of Churches. . . that such concepts as Divinity, Salvation, 'literalism in Bible interpretation,' will be spelled out as latent signs of actual or potential 'mental illness.' . . . The Act. . . would render it totally impossible for any individual religionist to continue a public ministry outside the. . . Council." – The Mercury Religion Supplement. Kennedy's so-called health program will be a hybrid cross between capitalistic Christianity and Marxism – or SOCIALISM, a state controlled ecclesiastical program as outlined in Revelation 13! THE NEW SOCIETY! "As the sign of the authority of the Catholic Church, papist writers cite 'the very act of changing the Sabbath into Sunday, which Protestants allow off. . . because by keeping Sunday, they acknowledge the (Catholic) church's power. . .' – An Abridgement of the Christian Doctrine, p. 58. . . Romanists declare that 'the observance of Sunday by the Protestants is an homage they pay, in spite of themselves, to the authority of the (Catholic) Church.' – Plain Talk About the Protestantism of Today, page 213. . . But when Sunday observance shall be enforced by law, and the world shall be enlightened concerning the. . . true Sabbath, then whoever shall transgress the command of God, to obey a precept which has no higher authority than that of Rome, will thereby honor popery above God . . . (Rome) is silently growing into power. Her doctrines are exerting their influence in legislative halls. . . Stealthily and unsuspectedly she is strengthening her forces to further her own ends when the time shall come for her to strike. . . WE SHALL SOON SEE AND SHALL FEEL WHAT THE PURPOSE OF THE ROMAN ELEMENT IS." – The Great Controversy, pp. 448, 449, 581. "And, if necessary, we shall CHANGE, MEND, or BLOT OUT the present Constitution so that the President may enforce. . . our humanitarian program and all phases of human rights as laid down by our... Popes..." – L'Aurora. "By unanimous voice vote at their annual conference in Washington on November 20 (1975), the Roman Catholic bishops of the United States launched a major political drive. The political movement is aimed at imposing upon all Americans the Vatican doctrine (no abortion). . . by means of an amendment to the United States Constitution. . . (which) would deny all women freedom of choice on abortion. . . Perhaps the strongest reaction came in an editorial in. . . National Catholic Reporter: 'If the 'pro-life citizens lobby' call energizes a Catholic vote, the bishops have succeeded in creating A CATHOLIC PARTY. . . If the bishops have created a Catholic party. . . they have unleashed a FEARSOME (Amen!) thing. The Catholic church. . . will have moved into. . . national politics as an identifiable political lobby party of massive proportions. . . (and) may have signalled a MAJOR CHANGE in the makeup of U.S. politics." – Church-State, January 1976. "A fear spread across the land that the United States is on the brink of a constitutional crisis. Twenty eight of the necessary 34 state legislatures. . . had passed resolutions requesting Congress to call a national Constitutional Convention (Con-Con) ostensibly to initiate an amendment to the Constitution to require a balanced federal budget. . . 14 state(s) calling for a Con-Con to outlaw freedom of choice on abortion. . . Since the Constitution specifically bars direct action by the people. . . special ratifying conventions or legislatures, representing bare majorities or even minorities, in the three fourths of the states with the smallest populations – about 40% of the U.S. population – could ratify RADICAL constitutional changes. And there would be nothing that the majority of Americans could do about it legally. . . What emerges. . . is a rather harrowing picture. . . Such a Con-Con could utterly destroy the religious liberty guarantees of the First Amendment, dilute all other rights. . . American freedom and democratic government could go down the tube. . . The serious threat. . . IS DEADLY SERIOUS." – Church-State, March, April 1979. "Except. . . during the 1960's. . .there have never been enough states to come close to triggering a national convention – until perhaps NOW. 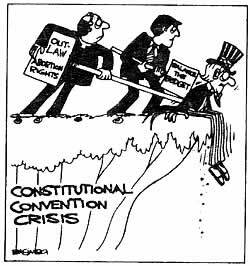 . . many opponents fear that a convention could become a 'runaway' group, bent on reversing two centuries of constitutional precedents." – Business Week, March 26, 1979. "Since the one and only Constitutional Convention of 1787, there has rarely been such a determined effort to convene another. . . The issue has already been injected into 1980 presidential politics. . . California Governor JERRY BROWN has supported the movement for a convention." – Time, February 1979. "America is currently besieged by an army of religious zealots who see the Government and the ballot box as instruments for enforcing CHURCH dogma. If the trend continues, WE'LL HAVE GOVERNMENT-ENFORCED RELIGION AND THE END OF A 200-YEAR OLD DEMOCRACY. IT'S TIME CHURCH AND STATE WERE SEPARATE ONCE AGAIN." Time. June 26,1978. "The question is not 'whether, but WHEN' Americans will be forced to conserve gasoline. U.S. Sen. Henry M. Jackson said, 'it will start out with a prohibition on the sale of gasoline on SUNDAY.' " Los Angeles Times, February 12, 1979. "President Carter asked Congress to give him power to order gasoline rationing and to close gas stations on weekends, probably starting with closing SUNDAYS." – San Francisco Chronicle, February 27, 1979. Senator Jackson: "This provision is the NATIONAL SUNDAY LAW." "The Energy Bill. . . signed by President Ford on December 22, 1975, sponsored by Senators KENNEDY and Jackson. . . (provides) civil penalty. . . ($5,000). . . not more than ($50,000 and 6 months prison or both)." – The Energy Bill, Public Law No. 94-153,p. 93. "Womb-to-tomb" national health program; Catholic majority in Congress; Bishops' "Catholic Party;" Con-Con; Energy Crisis' Sunday Law: these all show THE CATHOLIC PLAN FOR AMERICA is "silently growing in power" to make America Catholic, as predicted by "Gillis, editor of the Catholic World. . . in 1929 that 'America will be predominantly Catholic before the present younger generation dies." – Harper's. "THE ADVENTISTS ARE THE ONLY BODY OF CHRISTIANS WITH THE BIBLE AS THEIR TEACHER, WHO CAN FIND NO WARRANT IN ITS PAGES FOR THE CHANGE OF DAY FROM THE SEVENTH TO THE FIRST. . . REASON AND COMMON SENSE DEMAND THE ACCEPTANCE OF ONE OR THE OTHER OF THESE ALTERNATIVES: EITHER PROTESTANTISM AND THE KEEPING HOLY OF SATURDAY, OR CATHOLICITY AND THE KEEPING OF SUNDAY. COMPROMISE IS IMPOSSIBLE." – Catholic Mirror, Sept. 2 & Dec. 23, 1893. For over twenty years The Branch message has been sharing with us the wonderful revelations of the living Spirit of Prophecy showing the trials and glorious future of God's remnant church. 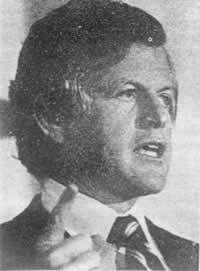 In 1976 Ben L. Roden, in "The Energy Crisis and Sunday Sacredness," revealed the imminent national health program outlawing independent evangelism and the Sunday law hidden in Kennedy's 1975 Energy Bill. In 1977, "Constantine to Carter," revealed the coming Catholic-control of America, and thrilled us with the prophecy of America's deliverance like Esther from Haman's death decree. Since the publication of these tracts, events have transpired showing us the validity of The Branch predictions. This tract brings us to the very "opening of the curtain" of Jacob's time of trouble over Sunday laws. Now as never before let us seek the truth and power of the Holy Spirit that we may stand firm for the Sabbath truth, separation of church and state, and become holy instruments through which God will deliver America (Assyria) into the Kingdom (Isaiah 19:23-25). Copyright© June, 1979. Revised December, 1979.